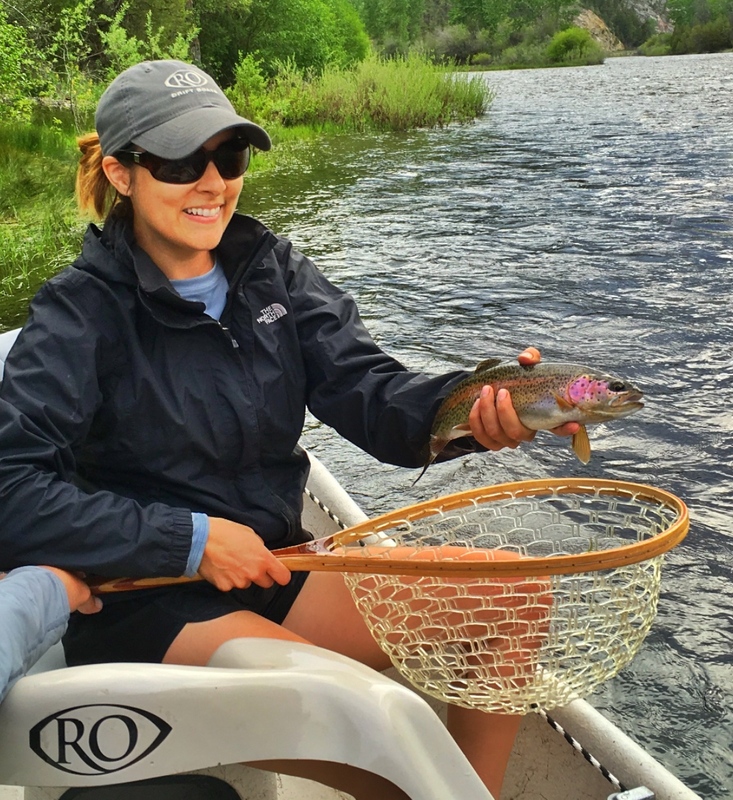 Southwest Montana is a bucket list destination for fly fishing enthusiasts from all over the globe, so you can understand my excitement when I got to spend a few days there completely immersed in the local fly fishing scene. 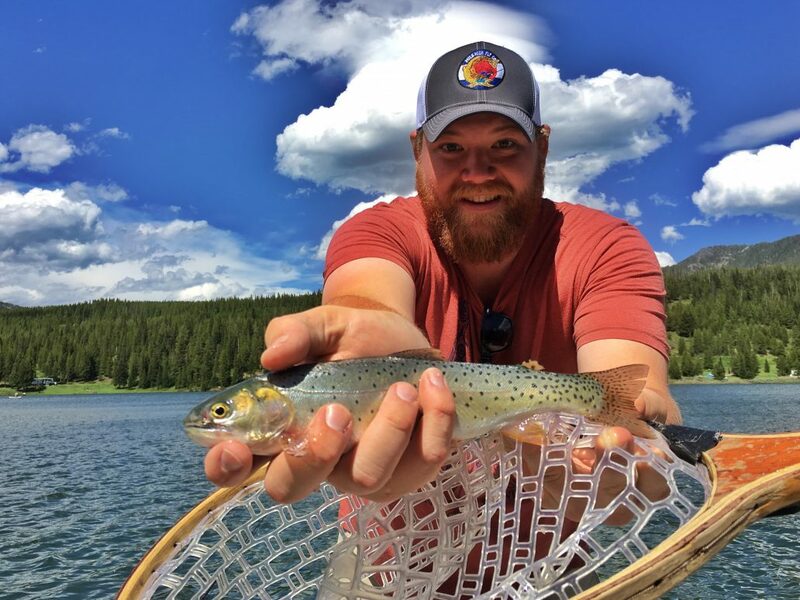 Luckily, I have a buddy from my days living and working in Yellowstone National Park who lives in Bozeman, owns a drift boat, and spends 99.9 percent of his waking hours obsessing over all things trout. 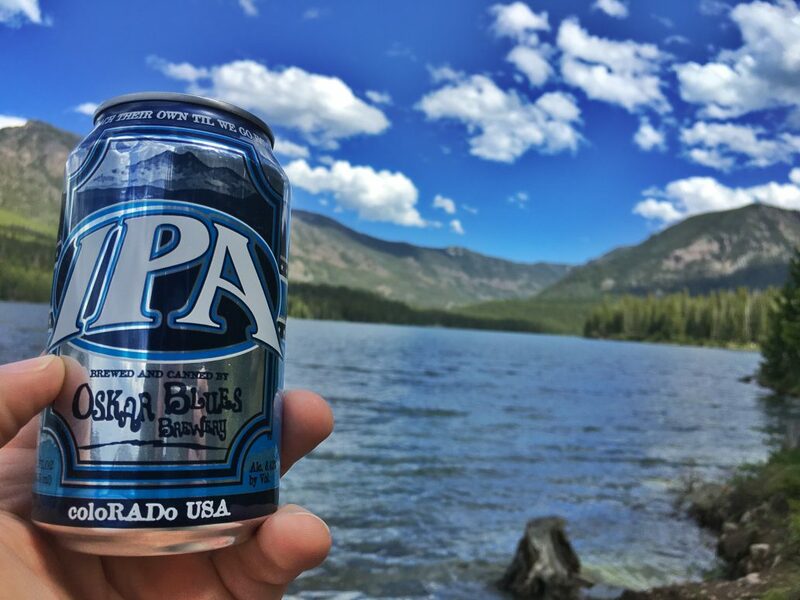 All I had to do was show up, sit back and enjoy the ride—and a few of Montana’s finest craft-brewed ales—while he shuttled me around to a handful of the area’s most renowned fishing holes. What follows are brief descriptions of each of those fisheries along with some photos of the success we enjoyed while fishing them. 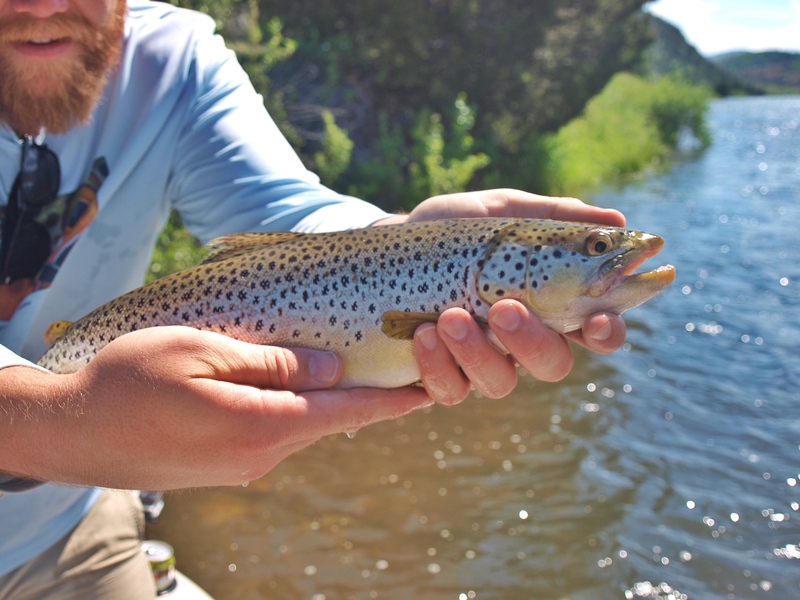 Named in 1805 by Meriwether Lewis, the Madison River is one of Montana’s premier blue ribbon trout fisheries. 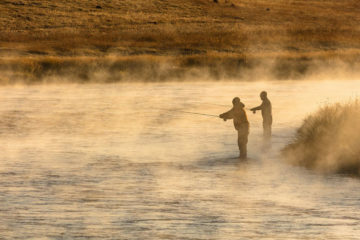 It originates in Yellowstone National Park, at the confluence of the Firehole and Gibbon Rivers—both famous trout rivers in their own right—and flows for about 180 miles until it joins forces with the Mighty Missouri River (more on that later). My day on the Madison was eventful and full of fish. Of all the rivers I had the pleasure of visiting during my time in Montana, this was the most productive. 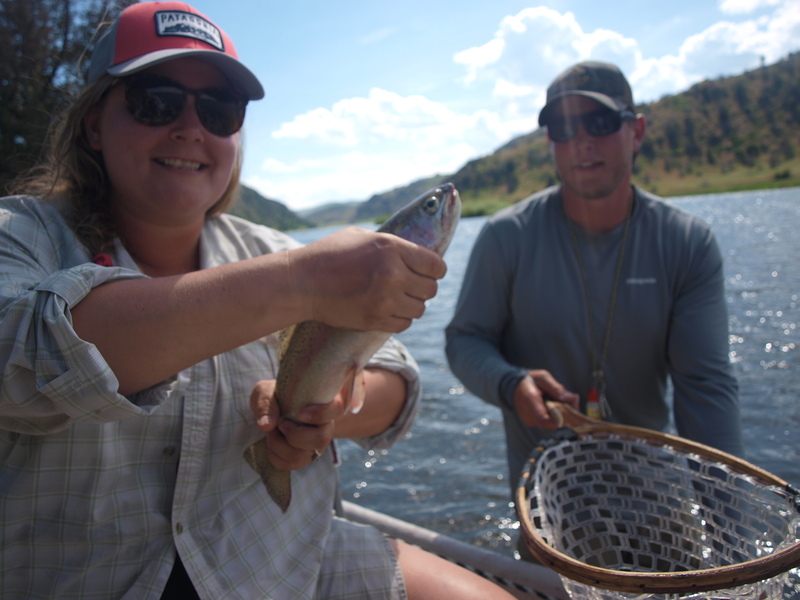 Browns and rainbows were plentiful—most falling victim to cadis pupa and olive hare’s ear nymphs—and the scenery was typical Montana, complete with high-rising, riverside cliffs and the occasional bald eagle circling above. If you ever make the trek to Montana don’t miss out on the Madison. 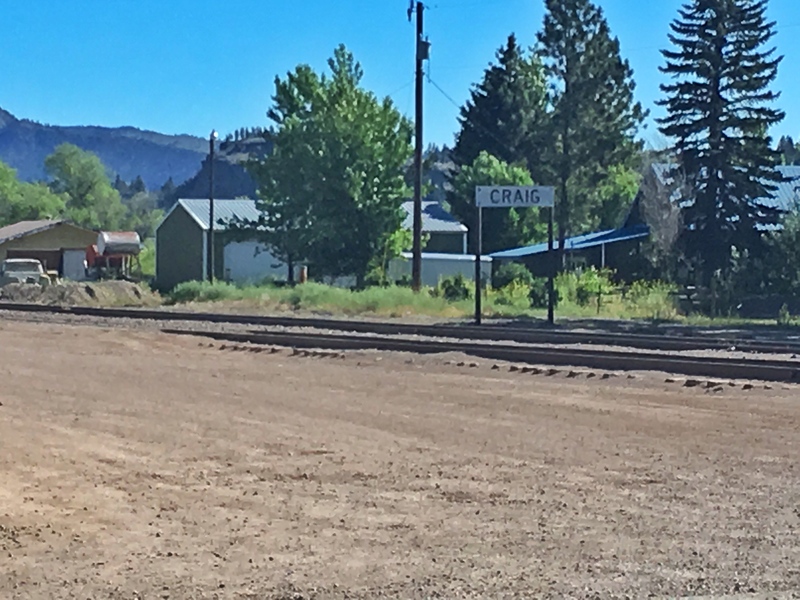 Hyalite Canyon is a go-to for Bozemanites looking for quick access to mountain biking, rock climbing, hiking, camping, and fishing—all in the shadow of Montana’s stunning mountain landscape. 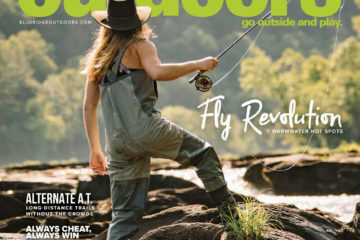 For us, fishing was the pursuit of choice, so we put the boat in on Hyalite Reservoir—a 206-acre high altitude lake perched at an elevation of 6,700 feet—and started casting streamers in hopes of hooking up with native cutthroat trout and arctic grayling. Fishing was understandably slower in this still body of the water, but I did manage to net one small cutthroat. Unbelievable scenery, craft beers, and good times with good friends dominated the rest of the day. There was something in the air when we showed up to at the banks of the Big Hole River on the morning of Friday, June 17. To me they looked like small, uncoordinated birds, but it turns out they were huge aquatic insects called salmon flies. Every year these gargantuan bugs make their ascent from the bottom of the Big Hole to its swirling surface. Most are quickly gobbled up by hungry trout. 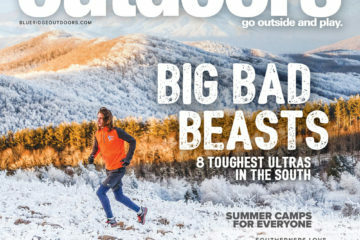 Others make their escape for nearby tree limbs. We were just happy to have a box full of flies in our possession that closely resembled these unique insects. 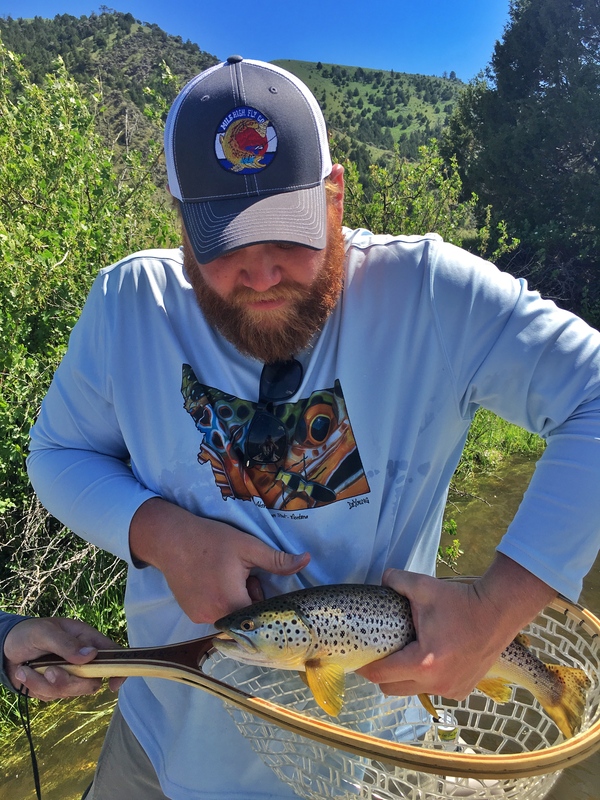 As soon as we put it on the Big Hole we noticed trout rising in every direction, and I had what I can only assume was a giant brown emerge from the depths to break my salmon fly off within the first 30 minutes. 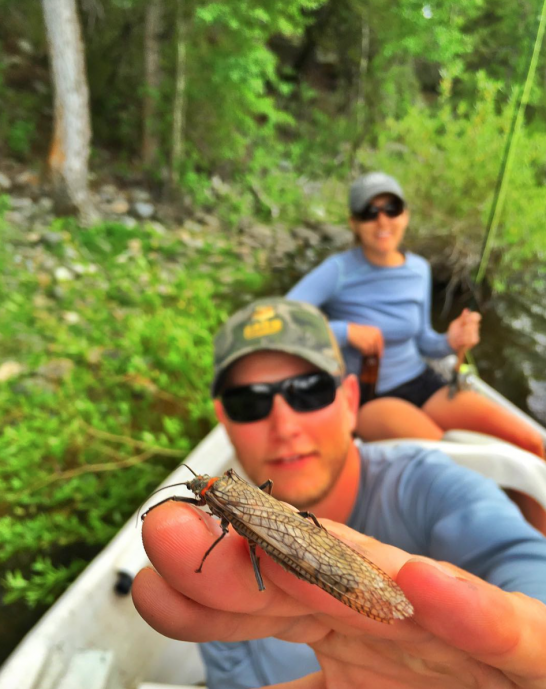 We continued to fish salmon fly dries and girdle bugs for the rest of the float. 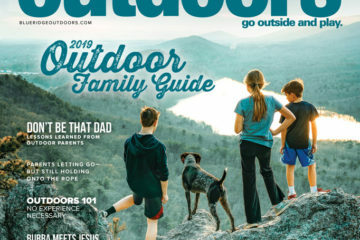 By the time we arrived at the takeout, where we had stashed our tent and camping gear a few hours earlier, everyone aboard had netted trout and spirits were high. The next day we woke up with the sun and re-embarked on our journey down the Big Hole. Saturday started with more technical whitewater and our drift boat even took on some of said water at one point. After a quick foray on the bank and some manual bilging with a Nalgene bottle, we were back on the river catching more trout on girdle bugs. 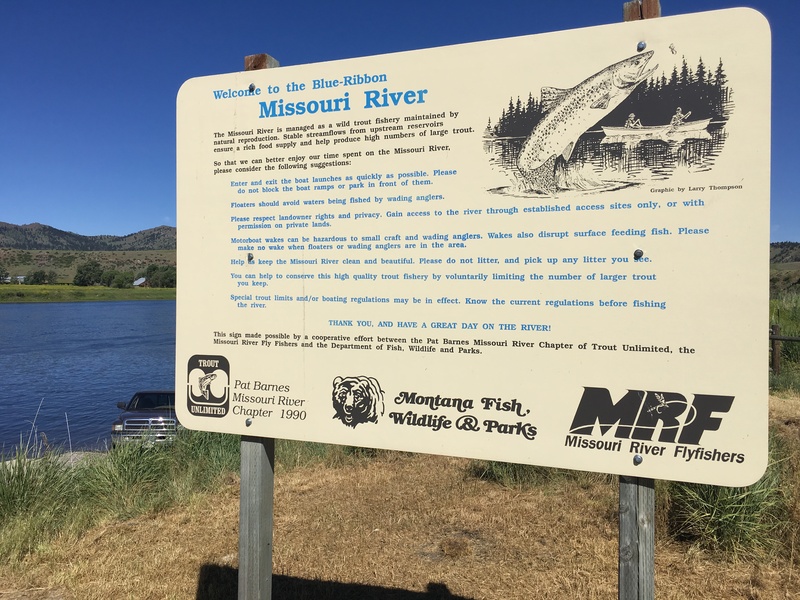 The Missouri River might be best known as the waterway that delivered the Lewis and Clark expedition from the midwestern frontier deep into the heart of the mysterious mountain West. Today it is known for delivering hungry trout into the nets of eager anglers. Our trip was no exception. We arrived during the heart of another famous hatch. Instead of salmon flies we were hoping to see hoards of caddis and pale morning duns. 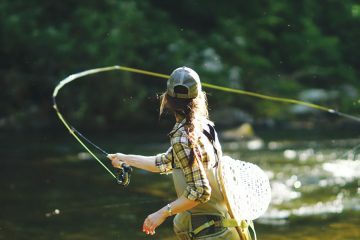 Unfortunately, the wind thwarted our dreams of all-day dry fly action, so we turned to trusty nymphs rigs, complete with split shots and bobbers. This proved to be the ticket, and before long Josh was battling the biggest fish of the trip on a secluded Missouri River side channel. 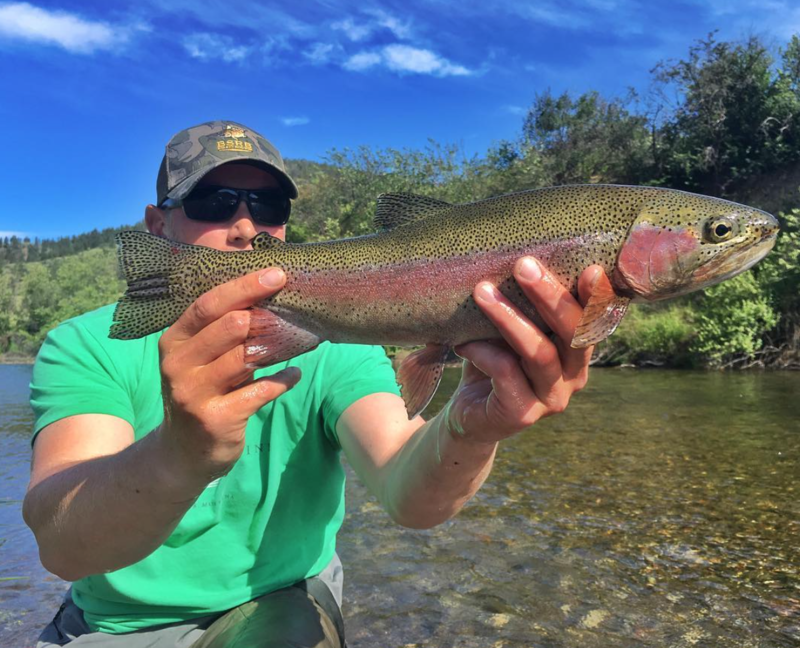 Needless to say, the giant rainbow found the bottom of his net, and a fitting cap was placed upon a perfect Montana fly fishing excursion, but not before indulging in celebratory beers, bourbon, and burgers back in Craig with the Missouri River still in view. Here’s to hoping I make it back soon.